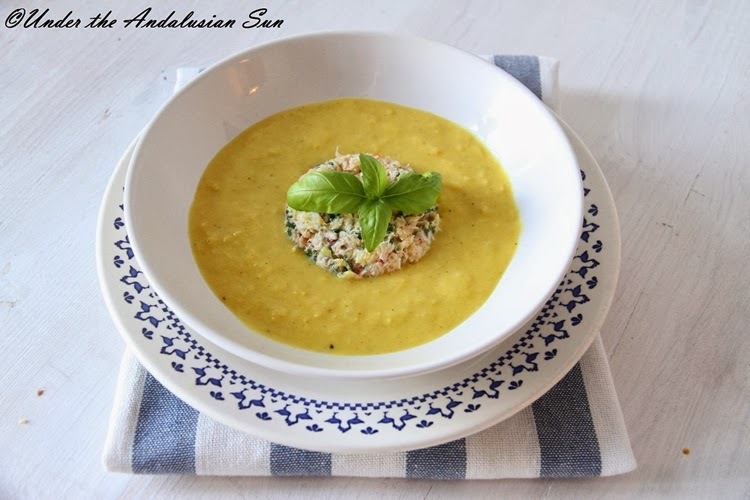 Since those dazzlingly gorgeous summer days continue (even in Finland), I've been on a constant lookout for ideas for chilled soups (that, and that bikini body)In Bon Appetit magazine I remembered coming across a recipe for cold corn soup served with lobster salad. Since lobster isn't (even in Spain) exactly the most affordable of ingredients, the actual recipe was filed away. But the idea lived on. The final inspiration came from Asian continent, since the combination of lime, coriander leaves, garlic and chilli is just so unbelievably refreshing. The soup turned out to be so brilliant that it actually works wonders served hot as well, so this will definitely be an often seen fixture even in the middle of the coldest and darkest winter. 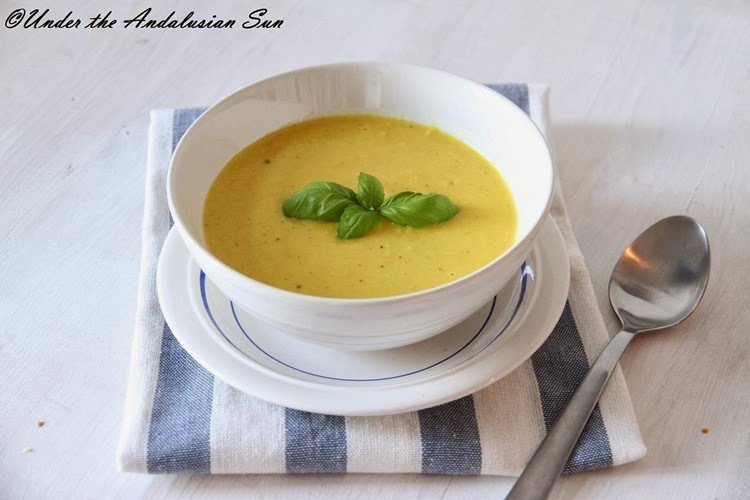 Corn gives the soup this amazing creaminess without a hint of cream. I thought crab meat would go well with corn and I still can't decide which version was better. Neither could the test audience, an Australian friend who, after a sting in Asia has settled in Russia. The freshness of the salad apparently complimented the flavours of the soup that well. Crab meat can be found at well-stocked supermarkets but also at Asian stores where the seafood selection tends to be fantastic. As are the prices. King prawns would work as well. As would probably that lobster too. Sauté the spices, onion and garlic in a mixture of oil and butter (about 1 tbsp both) When they've softened, add corn. Toss them in the spice mixture for a couple of minutes and add water. Cook until corn is done - about 10 minutes should do it. Blizz in a blender and run through a sieve to guarantee a smooth, velvety texture (not that I actually bothered...) Season with a dash of lime juice, salt and pepper. Serve hot or cold. If serving cold, let it sit in the cold for at least 2 hours before serving. In the meanwhile make the salad. Drain crab meat. Mix with the rest of the ingredients. Let the flavours come together by sitting it in the cold for an hour. Serve with soup. Works on its own too, like in sandwiches (in which case you want to crank up the quantity of mayo/ yoghurt).